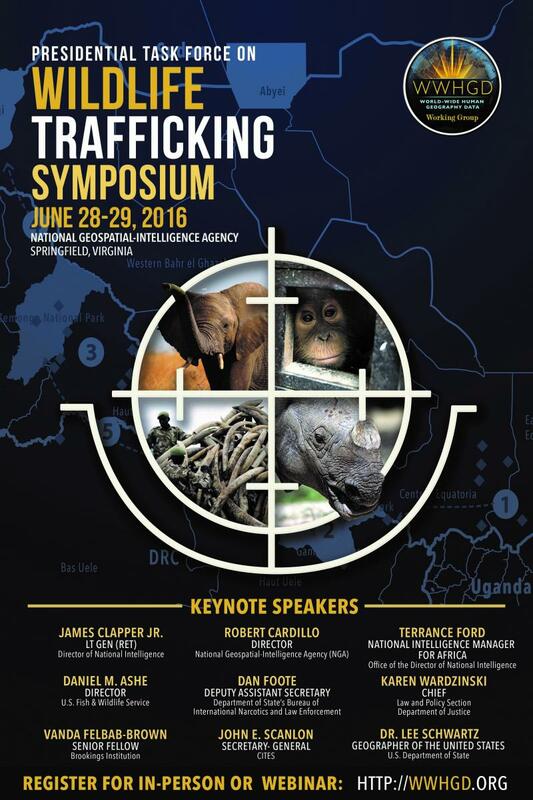 June 28 & 29, 2016, National Geospatial-Intelligence Agency, Allder Auditorium, Springfield, Virginia, U.S.A.
Members of the United States Government, the Intelligence Community, representatives of NGOs, academia and industry, distinguished guests, ladies and gentlemen. Good morning and thank you very much for the invitation to address you today – and I would like to start by expressing our most sincere thanks to President Obama, the members of the Presidential Task Force on Wildlife Trafficking, and the Director of National Intelligence, the Honorable James R. Clapper, for formalizing the United States Intelligence Community's commitment to this critical issue. CITES is an international legally binding agreement that sets the rules governing international trade in wildlife. The United States has been a driving force behind CITES ever since its inception. CITES is actually known in many countries as the Washington Convention, as it was the Unites States that hosted the Plenipotentiary Conference in Washington DC where CITES was adopted on 3 March 1973 – and, as we all know, in 2013 the UN declared the 3rd of March as – World Wildlife Day! The United States was also the first to sign CITES, it hosted our 9th meeting of the Conference of the Parties in 1994 at Fort Lauderdale and it currently serves as deputy Chair of the CITES Standing Committee. The United States has provided longstanding financial, political and technical support to this well-focused and highly effective Convention, for which we are most grateful. In fact, I could spend all of my time today talking about the great support that the United States provides to CITES and its Parties! I have however been asked to focus on CITES and tackling wildlife trafficking – and a good place to start is with the first ever World Wildlife Crime Report that has just been launched by UN Office of Drugs and Crime in Vienna and New York. This Report demonstrates a heightened sense of rigour in reporting on illicit wildlife trafficking, including through the compilation and analysis of 164,000 seizure records sourced from CITES and the World Customs Organisation and others. This landmark Report demonstrates that illicit wildlife trafficking affects all regions in different ways – with countries across the globe being implicated as source, transit or destination States, affecting over 7,000 different species. It confirms the industrial scale and serious nature of this illicit trade, which is being driven by transnational organized criminal groups, and in some cases rebel militia, is fueled by corruption and is having serious impacts on people, national economies and security. CITES is described in the Report as “an agreement of remarkable scope and power” that “ allows countries to reciprocally protect one another’s’ species according to a common set of rules”. As stated in the Report, CITES defines the international rules that criminals try to circumvent, with the two UN Conventions against corruption and transnational organized crime being the key international treaties for tackling the transnational organized criminal groups that are driving this industrial scale illicit trade and the pervasive corruption that enables it. The good news is that due to the efforts of so many over the past five years, including many of the people sitting in this room today, there is a global collective effort underway to combat illegal trade in wildlife – one that works right across the illegal supply chain and takes a three pronged approach of: enhancing enforcement, including tackling corruption; addressing livelihoods and how local people can benefit from wildlife; and demand reduction. This effort involves CITES Parties, the United Nations, treaties, international and national organizations, philanthropists and individuals, including members of the UK’s Royal Family. And most importantly it involves the enforcement, intelligence and justice communities, as well as foreign affairs, as one cannot combat transnational organized criminal groups and corruption without their deep and direct engagement – and the impressive list of speakers and the audience for this Symposium speaks volumes for what has been achieved in the United States through President Obama’s Task Force. 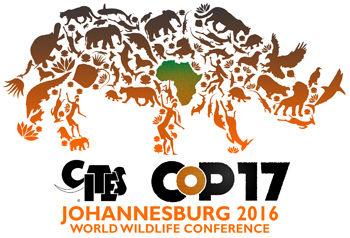 - It will be the largest ever CITES CoP. Our last CoP, CoP 16 in Bangkok in 2013, was our largest meeting up to that point in time. For CoP 17, we have a 26% increase in documents from Bangkok. This reflects the growing level of interest in CITES and its role in combating illegal wildlife trade and strictly regulating legal and sustainable trade where this is allowed, such as the bark of the Africa cherry tree from Africa, the wool of the vicuna from Latin America, and the meat of the Queen conch from the Caribbean. - The CoP will consider 62 proposals to change the CITES Appendices, which list the species that are subject to CITES trade controls, including proposals to add additional sharks, rays and over 250 timber species – as well as proposals to up list certain species already included under CITES, such as African grey parrots, African lions and all pangolins. The importance of a species being listed under CITES and thereby subjecting trade in these species to binding international rules – rules which bind source, transit and destination States – is emphasized in the World Wildlife Crime Report. - The CoP will address difficult and contentious issues to do with divergent approaches amongst CITES Parties on matters affecting trade in elephants and their ivory, as well as rhino horn, which if not resolved prior to CoP 17 may be determined by a vote, noting that CITES is a convention that does resort to voting where no consensus is possible. - The CoP will for the first time consider a draft resolution on corruption and wildlife crime and it is being asked to give further attention the work of the International Consortium on Combating Wildlife Crime, the relationship between CITES an the UN Conventions against corruption and transnational organized crime, wildlife crime and cybercrime, making even better use of controlled deliveries, modern forensics and specialized investigative techniques, as well as enhanced cross border cooperation, in combating illegal trade. - The CoP will consider well targeted interventions to combat illegal trade as it affects a number of species, including elephants – noting the successes achieved through the use of CITES National Ivory Actions Plans across the 19 key source, transit and destination countries, as well as cheetahs, rhinos, pangolins, totoaba, turtles and tortoises, tigers, rosewood and many more. - In addition to enforcement related decisions and resolutions, the CoP will consider a powerful set of proposals concerning targeted demand reductions strategies and how to better engage with local communities to ensure they benefit from the wildlife they are living amongst. - The CoP will be preceded by a high level event hosted by Minister Edna Molewa of South Africa on CITES and the UN Sustainable Development Goals, and, with the financial support of the United States, we will be hosting the second global meeting of the world’s wildlife enforcement networks, following the first meeting that was held at CITES CoP 16 in 2013, which was also financially supported by the United States. Many other events are planned around the CoP, including by international organizations, NGOs and philanthropic entities that are actively engaged in CITES issues, some of whom are with us today. The documents submitted by the United States to CoP 17 cover a wide range of issues, from species-listing proposals, to working documents on combating wildlife trafficking and demand reduction, which further demonstrates the level of interest and engagement of the United States in CITES. Anyway, I could go on for another hour about CoP 17 for which we have a record 180 items to work through but I think my time is up! Thank you again to all of you for your extraordinary support for CITES and for inviting me to join you this morning. I am sorry that I cannot be there in person but I look forward to seeing you all in South Africa in September for CoP 17 – the World Wildlife Conference.